The AmDTuning.com with Cobra Exhausts team brought the curtain down on the 2017 Dunlop MSA British Touring Car Championship season with two more points finishes at Brands Hatch. 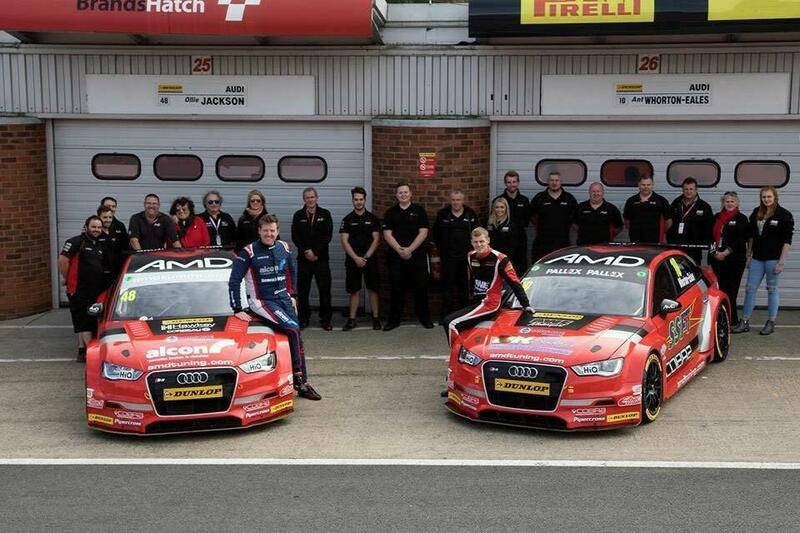 The West Thurrock-based team went into the weekend eager to challenge inside the top 15, and more points ensured that the Audi squad came away from the season finale with its highest ever points tally in both the BTCC Teams Championship and the Independents Team Trophy. Tamworth racer Ollie Jackson would be the man to score on Finals Day having battled back well from a tough qualifying session that saw him line up 26th on the grid for the opening race. Making up places from the start when the lights went out, Ollie battled his way forwards towards the points and crossed the line in 14th spot to pick up two championship points. A 15th place in race two gave Ollie his 13th points finish of the campaign and although he just missed out on making it a hat-trick in race three, he concluded the season in a solid ninth place in the Independents’ Championship standings – only missing out on a top eight finish on podium countback. “Race day was a great turnaround from qualifying,” he said. “We got the car working and took a big step forwards that allowed us to push into the points. It’s a shame we couldn’t get higher into the top ten but then race three was a bit of a lottery with the conditions. We could have scored again there but there was a bit of contact that cost us the opportunity to get more points. “It’s been an up and down season but from where we started, but I think we’ve made loads of progress and picked up some good results. I’ll look back on the season in a positive manner and I think we’ve done a good job as a team. The boys have been fantastic and the prep work they have done has been second to none. Lichfield-based team-mate Ant Whorton-Eales was also eager to challenge for points and qualified 22nd on the grid for the opening race of the weekend. Having just missed out on the points scoring positions in race one, Ant was hopeful of pushing forwards in race two only to stuggle to get heat into his soft compound Dunlop tyre in the early stages of race two. Once the tyre was performing at its best, Ant was one of the quickest drivers on track but had to settle for 18th place at the finish. Ant’s season would then draw to a close with a 25th place finish in race three after mid-race contact that damaged the rear of his car and a trip into the Paddock Hill gravel trap conspired to cost him valuable time. The rookie ends the year twelfth in the Independents’ Championship. “We had a good run in the opening race but then struggled a bit with the soft tyre in the opening laps of race two,” he said. “I thought we were screwed to be honest but then the tyre came good and we had some really good pace – we got stronger as the race went on when I expected our speed to drop away. “I felt the pace we showed in the wet final race was good but then I took the wrong line into Paddock Hill and the back stepped out and I went into the gravel which is a real shame as we could have pushed towards the points; although the damage I picked up to the rear of the car might have stopped me from achieving it. Team boss Shaun Hollamby declared himself pleased with the way the season had gone, and predicted that good things lie ahead as a result of the progress made during the season. “It’s good to end the year with more points on the board and both drivers have done a good job again,” he said. “The BTCC is so tight that is hard to make up places but that is what they both did and they showed that we have good pace in the Audi once again. “I’d like to thank both Ollie and Ant as well as everyone in the team and all of our sponsors, particularly Cobra Exhausts, for what they have done this season as we wouldn’t be racing without the combined effort of everyone involved.